On the morning of our second day in Rome I woke up early to the sounds of the hustle and bustle of Rome drifting from Via Cavour up and trickling through the old-fashioned windows of our studio apartment. T'was most convenient as I am the sort of tourist* who endeavours to wake up early, see and do as many things as possible (God forbid if one item on the itinerary goes unchecked), and be in bed by the very respectable hour of midnight. *A happy side effect of travelling is that it enforces a rigidity so often lacking in the schedule of a freelancer, even now, two weeks later I bolt out of bed at eight and review the day's tasks. This is hardly groundbreaking nor innovative for those who commute to 9 to 5 jobs working for other people. But I work for myself and this is revolutionary, dammit! I'm even contemplating buying a Nespresso machine for mornings! Henry made me a pasta breakfast while I shoved two baby sized bottles of prosecco and our tickets for the general audience with Pope Francis into my purse. An Uber was summoned and we sped away to the Vatican City. Yes, I did order that dress (a copy of Dolce & Gabbana's Roman dress) and iPhone case especially to wear in Rome. What? I love thematic dressing. I should have got myself a pair of gladiator sandals too. We were this close to His Holiness. The beginning of his papal audience was more like a music festival what with Pope Francis arriving on the back of a Jeep to fanfare, cheering, and high-fiving his adoring fans. I blogged about the Vatican City and all things holy in a separate post, here. After the papal audience I realised that I'd stupidly left our tickets for the Vatican Museums in the apartment so we took another Uber back to the flat to retrieve them. €25 each way, if you must know. We had a couple of hours to kill so we wandered into the grocery store across our apartment. 'Elite' looked like a fancy version of Oddbins, with its display of vintage champagnes and fine wines artfully arranged on rustic wooden barrels in the tall, curved, dark wood windows. Elite is actually a neighbourhood grocery store with a small deli. The decor, with its tall dome-shaped windows, marble-like tiles, lacquered dark wood shelves and high ceilings adorned with frescoes makes Waitrose look like vegetables sold on the side of the road. Paris has Porsche for Uber, and Rome's local grocery stores are grand. Come on, London! How am I suppose to whet my appetite (for shopping) without a fresco of a polar bear battling his hunters? Rome's infamous 'naughty pasta' that I just refuse to buy on principle. What principle? That even tacky novelties have a line. Chopped and whipped up a quick and tasty lunch for Henry and I. After lunch we headed back to the Vatican City. As you may have read from my Vatican City blog post, the Vatican Museums were overwhelming in all its vast, splendid, beautiful glory. What I forgot to mention was that the blisters on my feet were equally epic. I caved in and bought a cheap pair of flip flops from a tiny 'hole in the wall' shop on Via della Maddalena. These €4.50 flip flops saved my life in Rome. Here's a tip, never break in new shoes while on holiday. 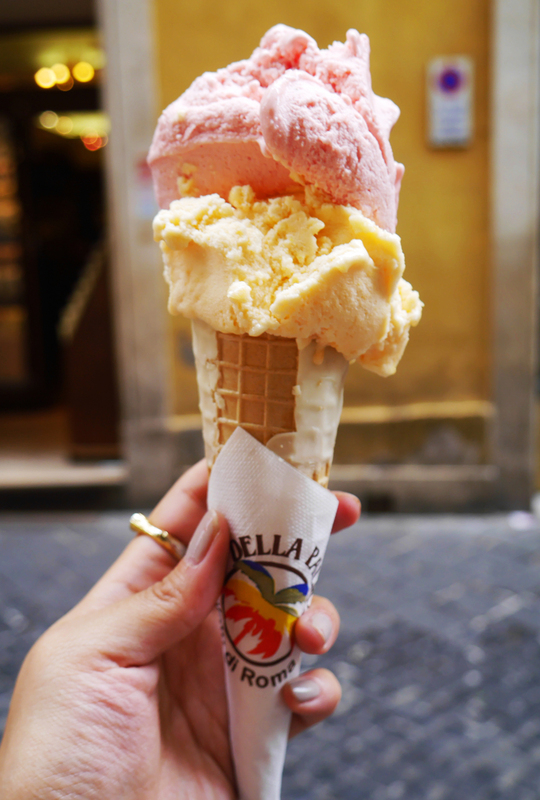 We were in Via della Maddalena for the sole purpose of sampling the gelato of the famous Gelataria Della Palma. This legendary ice-cream parlour whose origins can be traced back to the early 1900s now serves over 150 flavours and has expanded from Rome to also New York, Los Angeles, and Costa Rica. Inside Gelateria della Palma is a long counter snaking around the parlour, like an undulating train carrying many flavours of ice cream. The way you go about buying an ice cream is different, you go up to a separate counter and pay for the size of your cone, take the receipt back to the ice cream counters, show them what size you paid for, and then tell them what flavours you want. I suppose it is so that the waiters can concentrate on their job and keep the ice cream clean by not handling any money. I went for two flavours; one of my current favourites peach, and watermelon in a white chocolate coated cone. Being a scruffy boy, Henry had something rich and chocolately. 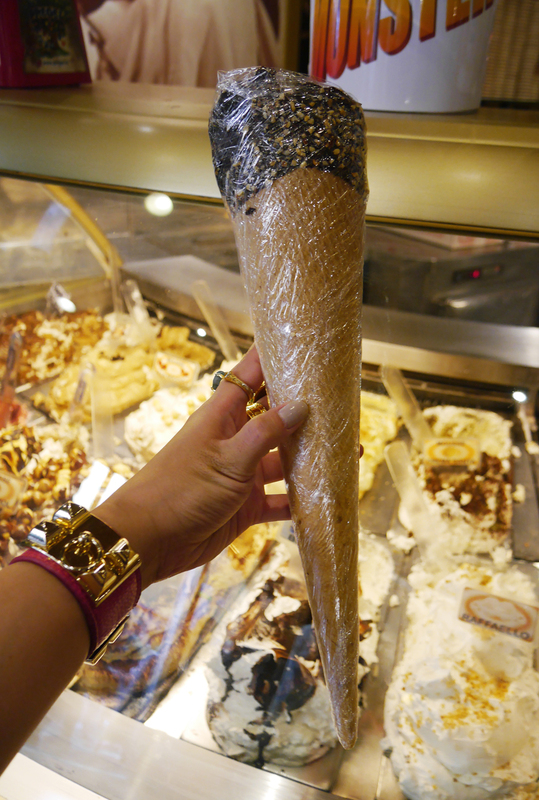 And of course he got it all over his face while I expertly licked my own gelato into a tidy shape (the trick is to lick it upwards from where it meets the cone so as to stop it from melting or trickling, then use your tongue to push it inwards to keep the shape neat). Henry, to the police: "I like your vehicle, can I have it?" Them: "No!" On holiday I wander with a purpose, choosing to Rome in (haha) specific areas so that even the most meandering walk is packed with things of interest. To be honest it's not hard to do in Central Rome. Anyway, it was with that purposeful careless wandering that we ended up in Piazza Navona. 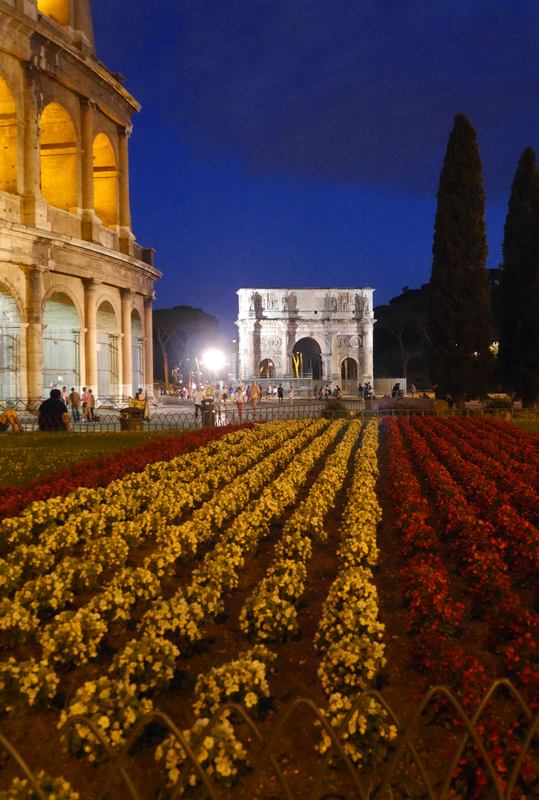 This square, a highly significant example of Baroque Roman architecture, is built on the site of the Stadium of Domitian, built in 1st century AD, and follows the form of the open space of the stadium. The ancient Romans came there to watch the agones ("games"), and hence it was known as "Circus Agonalis" ("competition arena"). 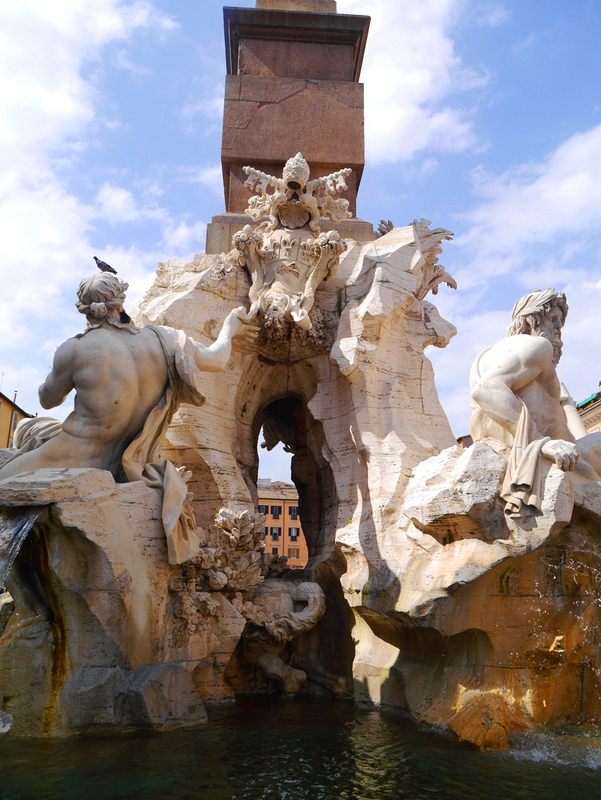 It features important sculptural and architectural creations: in the center stands the famous Fontana dei Quattro Fiumi or Fountain of the Four Rivers (1651) by Gian Lorenzo Bernini, topped by the Obelisk of Domitian, brought here in pieces from the Circus of Maxentius; the church of Sant'Agnese in Agone by Francesco Borromini, Girolamo Rainaldi, Carlo Rainaldi and others; and the aforementioned Pamphili palace, also by Girolamo Rainaldi, that accommodates the long gallery designed by Borromini and frescoed by Pietro da Cortona. Piazza Navona has two additional fountains: at the southern end is the Fontana del Moro with a basin and four Tritons sculpted by Giacomo della Porta (1575) to which, in 1673, Bernini added a statue of a Moor, or African, wrestling with a dolphin, and at the northern end is the Fountain of Neptune (1574) created by Giacomo della Porta. 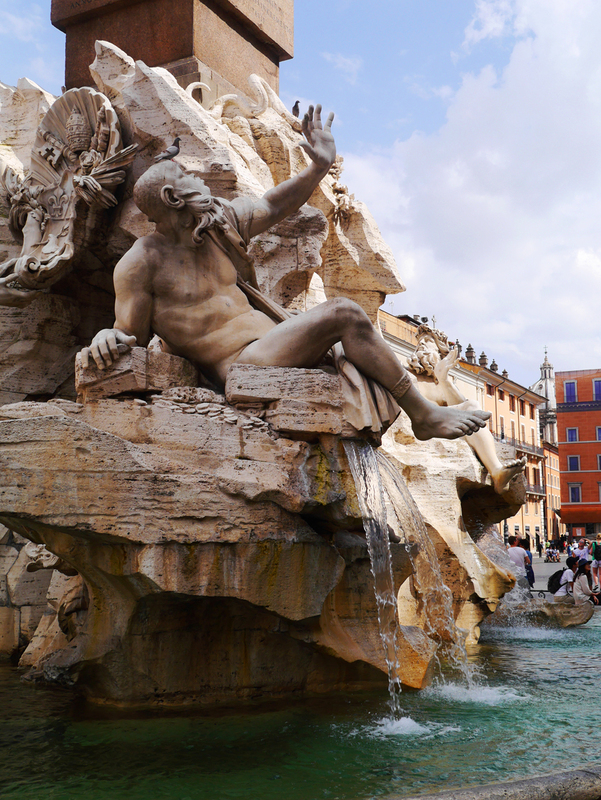 The statue of Neptune in the northern fountain, the work of Antonio Della Bitta, was added in 1878 to make that fountain more symmetrical with La Fontana del Moro in the south. At the southwest end of the piazza is the ancient 'speaking' statue of Pasquino. 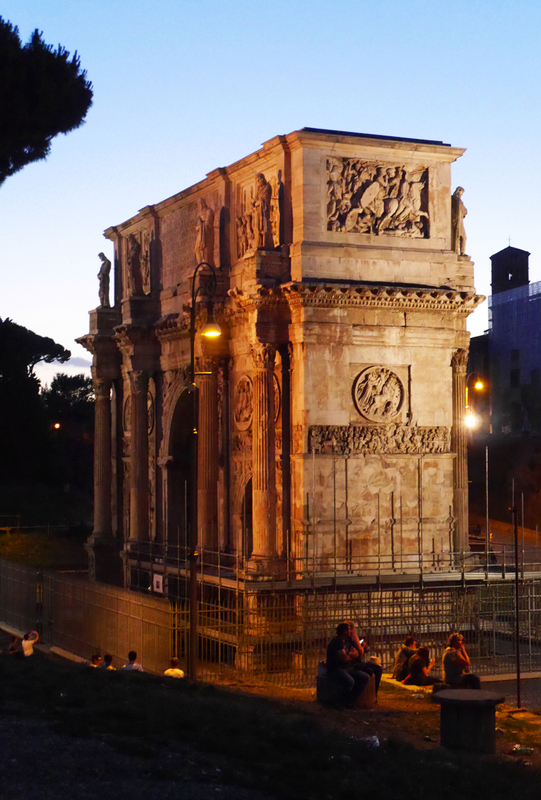 Erected in 1501, Romans could leave lampoons or derogatory social commentary attached to the statue*. *The predecessor of blogs, Reddit, and online forums! ...and he emerged looking distinctively Italian. Be still my beating heart. We headed back to the apartment to freshen up before dinner. By freshen up I mean Henry had a cigarette and I people-watched out of the window. Spotted a newly married couple crossing the road! Congratulations! With the same determination to wander with a purpose*, I googled and found a nearby dinner destination that ticked all my snob boxes. Small and family run? Check. Popular with locals, not especially known to tourists? Check. Tables outdoor in a tiny cobblestoned alley so typical of Rome? Check. So obscure by my standards that I forgot the name of the restaurant? Check. *Yes, I do think it's ironic that I contrive to be casual. Asparagus and four cheese pizza for me, something with a lot of meat for Henry. 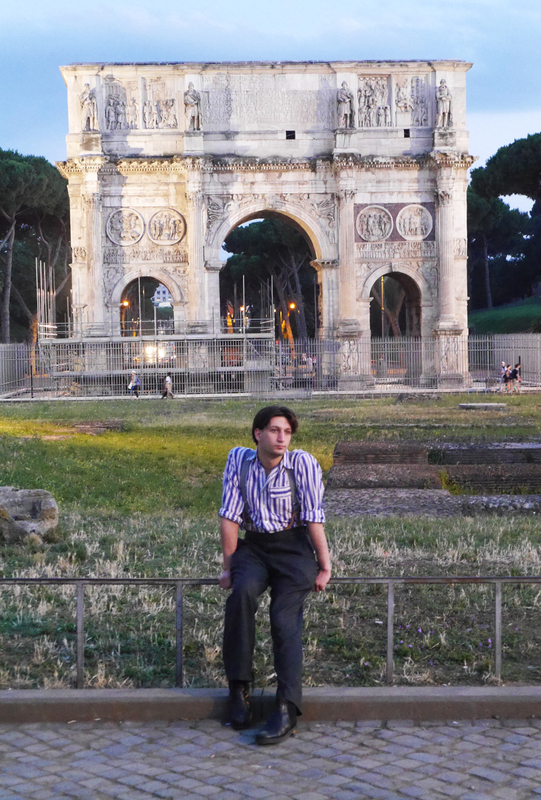 After dinner we took a stroll past the ruins of ancient Rome. "Henry darling, what do you think of Rome?" Henry points at ruins: "It's ruined for me." 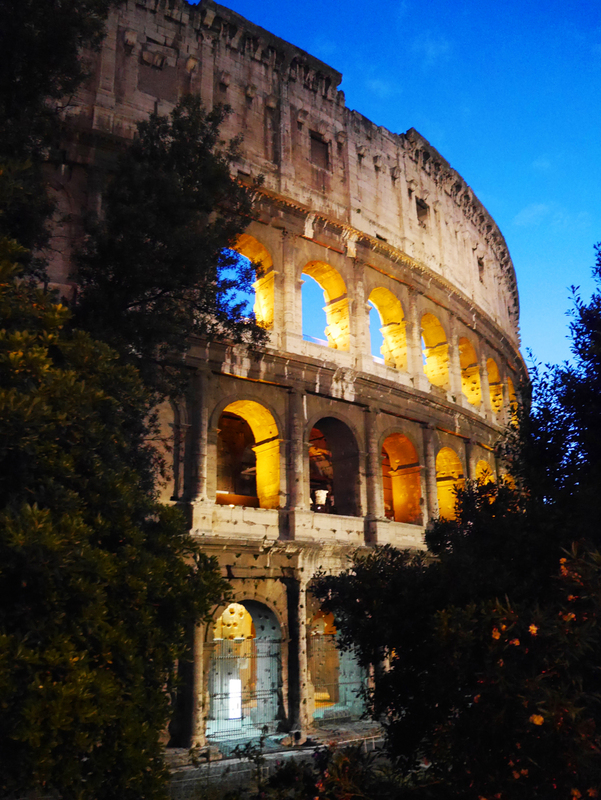 We took advantage of our close proximity to the Colosseum, admired it lit up in all its glory and enjoyed it without the presence of the the usual hundred strong crowds of tourists. We finished off our night with 'midnight ice-cream madness!'. Henry bought four flavours of gelato to take away and we ate the whole thing in bed watching, wait for it, BBC's Rome dubbed in Italian. Henry knows the entire script by heart so he spoke over the dialogue and dubbed it back in English for me. Ha! More Roman adventures to come. Great post, and I love that your man dubbed the whole show back to English for you! I play a similar game with my fella, although probably a lot more irritating, which is pretending to voiceover everything in David Attenborough style-y...! What camera are you using? Love your photos they are beautiful! !